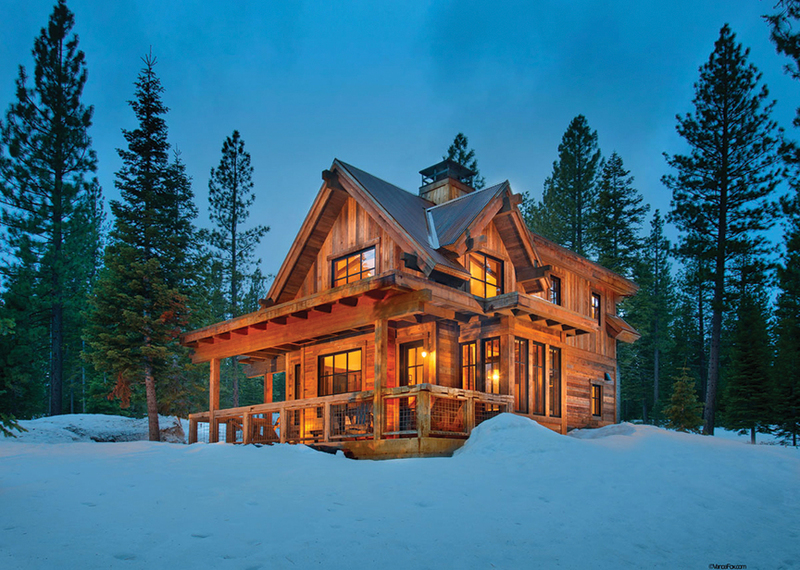 Before constructing their dream vacation house in Truckee’s Martis Camp, a couple (who wish to remain anonymous) first wanted a simple cottage built on the property to serve as their temporary residence before the main house went up, then as a guest home for visitors. They wanted it to look like it had been there for years, and they needed it to accommodate themselves, two daughters and two golden retrievers without everyone ending up on top of each other. To accomplish the task, the couple called in SANDBOX Studio designer Scott Gillespie and Truckee builder Mark Tanner Construction. Gillespie set to work designing a spacious, two-level guesthouse in a tight envelope—882 square feet. A one-car garage is adjacent to the home. With that thought in mind, Gillespie packed windows into the two-bedroom, two-bathroom design. Tanner’s crews finished the home in four-and-a-half months at the end of 2010—just before the relentless winter of 2010–11. The lady of the house immediately appreciated the array of windows. “With all of those storms, you’d sit in that family room and feel like you were inside a snow globe,” she says. The home’s rustic exterior features Montana reclaimed barn wood and a COR-TEN corrugated steel roof, as well as a wrap-around porch to let the four-legged family members out to stretch. Inside, a galley kitchen and adjacent master bedroom and bath opens to a 16-foot-by-16-foot great room with high ceilings and a large, open-air stone and wood fireplace with hot-rolled steel trim. 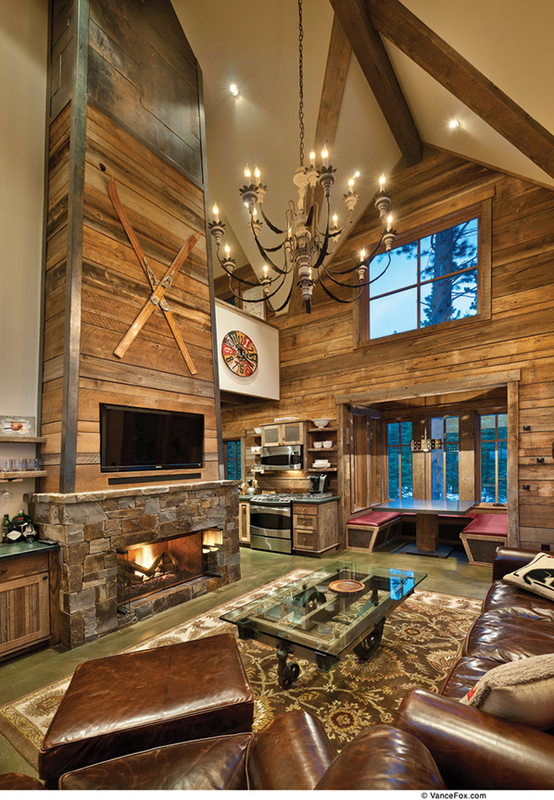 Tanner attached a pair of antique wooden skis—the homeowner’s mother’s—in a crossed design above a flat-panel TV over the fireplace. An adjoining nook offers overflow diners from the kitchen a place to sit and eat. Green mottled concrete flooring was poured for durability, Tanner says. A compact reclaimed oak staircase behind the fireplace leads upstairs to a small ‘homework’ nook for the couple’s daughters, a guest bathroom (complete with a claw-foot tub) and a guest bedroom. The family spent a year and a half in the cozy cabin before heading next door to their spacious and comfortable main house. But guests still make frequent use of the home—enjoying the snow globe ambiance no matter the season.